Establishing healthy habits as part of your morning routine isn’t just about getting up at the crack of dawn; the activities you choose to do as part of your morning routine are also vital for long term weight loss success. One of the main benefits of a healthy morning routine is that it generates positive momentum for your healthy habits for the rest of that day. Momentum is pivotal to implementing healthy habits consistently. Even by doing something really small for your health in the morning, you create a foundation for success for the rest of the day. Ultimately, if you want long term weight loss success, it is important you consider how to build some foundational healthy habits into your morning routine. In the last post we discussed the literature on why morning routines are so important and how to establish a consistent routine. In this post I will be sharing the top 2 evidence-based healthy habits you could build into your routine to enhance your success. The first step takes less than 30 seconds to do and is something we could all incorporate to improve energy, focus and wellbeing. 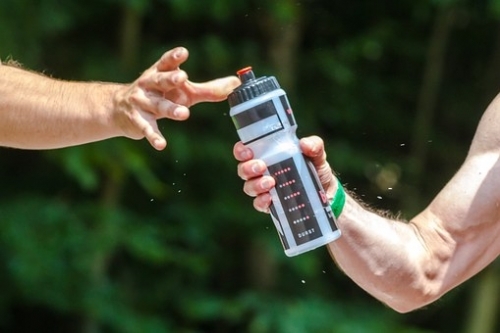 One easy win that is often overlooked is hydration. Keeping hydrated is one of my foundational healthy habits. It helps keep me focused throughout the day and also stops me mistaking thirst for hunger. To help myself maintain this habit, I carry an eye-catching water flask with me everywhere I go. I bring it into meetings or put it on the desk in front of me when I work. This acts as a visual prompt to keep hydrated. The 6-8 hours (recommended for sustained weight loss success) of sleep is a long time to go without water. Drinking water first thing in the morning has been associated with increased alertness, an enhanced immune system, and even an improved metabolism. Interestingly it has also been shown that even mild dehydration can have a negative effect on mood. Dehydration is closely linked to fatigue or low energy. For many of us, feeling tired can often trigger us to turn to food to give us energy, even when we are not hungry. To offset this, and the impact it can have on your success, it is worthwhile establish the habit of drinking a glass of water first thing in the morning. Chop up a lemon into slices and leave it in the fridge to add to water – this tends to make it more appealing. The second key element for your healthy morning routine takes a little bit longer than drinking a glass of water, but, given its positive impact not only on your physical health, but also on your appetite, mood, productivity and sleep, it is absolutely worthwhile. In a study examining what determined successful adherence to exercise, it was found that the people who adhered to an exercise routine long term, were those who exercised in the morning. Our bodies and minds love routine. It takes the thinking out of your daily activities. We quickly adapt and the routine becomes second nature. We wake up at the same time and go to work at the same time, so if you build exercise into your daily morning routine it makes it much more likely that it will happen consistently. Additionally, it is much less likely that things will crop up in the morning and prevent you from working out. In contrast, in the evening, you are much more likely to become fatigued, or distracted by family, friends or work. We know that exercise is good for us, but why is morning exercise, specifically, better? Research has shown that exercise increases your productivity, produces positive feelings (endorphins), and improves circulation. This helps wake you up and improving focus for the rest of the day (some studies claim mental focus can be improved for up to 10 hours post workout!). Whilst exercise in general is known to improve sleep quantity and quality, research has shown that those who exercise in the morning sleep better than those who exercise in the evening. It is thought that this is due to the stimulating benefits of exercise (as mentioned above in relation to increased productivity) making it more difficult to nod off after an evening workout. And, as we know, good sleep helps control the specific hormones that influence appetite and cravings. By getting your exercise in first thing in the morning, it helps build precious momentum. You approach your day differently, you are more likely to make healthier dietary choices and less likely to sabotage your healthy habits. Interestingly, like sleep, exercise has been shown to reduce appetite inducing hormones in some cases, potentially making you less susceptible to temptation during the day. Make it as easy as possible for yourself. Have your bag packed, your workout gear ready to go, a bottle of water waiting. Put your kit beside the door or somewhere you would literally have to trip over it to get out the door. Give yourself as little as possible to organise. It should take you no longer than 10 minutes to get up and go. Exercise before breakfast If you want to maximise the fat burning effects of exercising in the morning. Make yourself accountable. Exercise with a friend or sign up to a class you need to pay for in advance. Research has shown enhanced accountability is a powerful motivator. The most important thing to remember about establishing healthy morning habits is to make it relevant to you and adapt as needed. I’ve adapted my own through years of experimentation. I like to drink water first thing to hydrate myself. I like to exercise first thing as it’s a foundational habit. Though I was never previously a morning exerciser, I trained myself over a few months to become one. I’ve now established these habits to the point that when they don’t happen I miss them, I feel tired and less motivated to maintain my other healthy habits. However, even given the breath of evidence in its favour it is possible that exercising in the morning may not be for you. Certainly, there are others that prefer to exercise at lunch as it gives them a boost of focus for the afternoon. Or you may have children, so getting out the door in one piece is your priority. There isn’t a one-size-fits-all solution. It is about examining your current routine, making tweaks to improve it and finding out what works for you. That said, if it is a possibility, given the strength of the evidence in favour of morning exercise, try to incorporate exercise into your morning routine a couple of times this week. And, in any case, begin with a glass of water! Next week I will be sharing the top insights into how to help resist temptation and stay on track with your healthy habits this Halloween. I am running my final phone open day of 2017 on Monday November 6th. This is a chance to discuss your main barrier to success and any questions you may have about your habits in a free 20 minute consultation. Places are limited to 6 people so email info@weightlossiq.co.uk now with your availability to reserve a call.